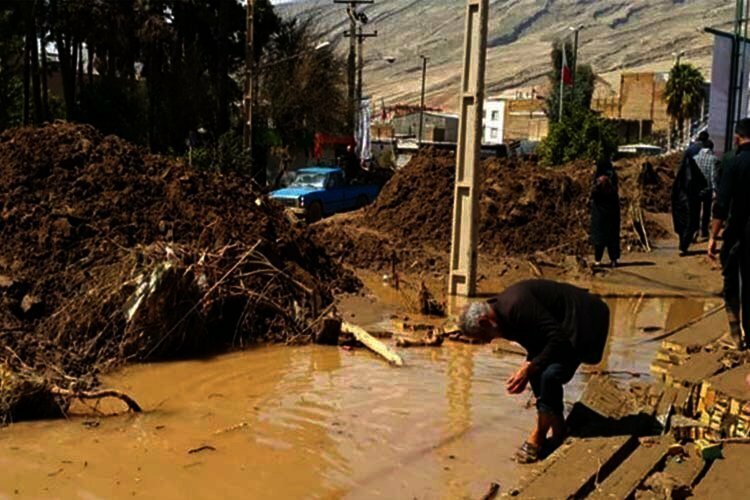 Iranian MPs are saying that conditions in the western province of Lorestan which was ravaged by floods in the past few days was “on the verge of disaster” with homeless locals forced into open fields without minimum supplies. آقای روحانی!#لرستان در آستانه یک فاجعه است؛ #پلدختر در گل فرو رفته. نیازهای اولیه مردم مانند غذا آب و دارو تأمین نشده. بی نظمی و بی برنامگی بیداد می کند. سامان دادن به این وضع نیاز به مدیریت ملی و بودجه فوق العاده دارد. “Mr. Rouhani! Lorestan is on the verge of a disaster. Poldokhtar has slumped into mud. The basic needs of the people including food, water and medicine have not been provided. Disorder and lack of planning is extensive. Organizing this situation needs national management and a large budget. The situation will not be managed with weak provincial management and donations,” he tweeted today. The town of Poldokhtar in Lorestan Province was engulfed by flood water in the past few days. When waters subsided, videos on social media showed cars and homes sunken in thick layers of mud. The flood stricken people who have lost everything to the floods blame the regime for the scope of the damage and its incompetence in providing relief. Local youths and even children are erecting a flood dam to prevent floodwaters from engulfing their homes. The Representative of Poldokhtar in Iran’s parliament told the state-run Fars News Agency today that “a number of flood stricken locals have been living in open fields for two days”. The Majlis MP said that the number of helicopters were limited and could not provide adequate relief adding that roads had to be opened. "People had sheltered on the roofs,There were no helicopter to save them. Many houses were collapsed & its residents are missing"
The flood damage is massive. Locals complaining about government incompetence.